The TJ front axle control arm mounts have a bad habit of finding obstacles on the trail so BDS offers these LCA weld on skid plates. These 3/16" plates protect and stiffen the lower control arm mounts on a Dana 30 or the TJ Rubicon Dana 44 axle. This is one of the best upgrades that you can do to protect the front axle. 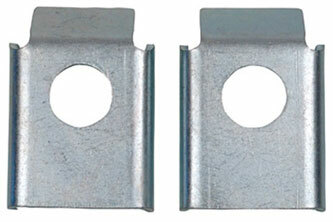 These skid plates even have a clearance hole to access grease fittings on aftermarket control arms.